I swear, this wholesome-looking meal isn’t penance for anything. It’s not a budget-friendly apology for the frenetic unplanned redecorating project or atonement for the fact that I’ve basically only wanted to eat chocolate, peanut butter, bread and pasta for the last 22 weeks. It’s not compensation for the frosting that didn’t make it onto the cake and was eaten instead with a spoon, or the impulsive meringues last weekend. It’s only ever-so-quietly a warning that the next thing coming on this site is so decadent, you might wish to advance yourself some greens, grains and beans. It is, however, something of a compromise. Just about the only vaguely nutritious thing I’ve consistently craved since our newest family member started making its presence known are things we could put on, in, or near a tortilla for dinner. I’ve made ground beef tacos, scrambled eggs on soft tortillas, chicken fajitas and charred cauliflower quesadillas and I’ve tried to branch out (look, pork chops! And hey, it’s a salad!) but I always come back to the fact that if didn’t contain avocado, pickled onions, hot sauce, and an unholy amount of ground cumin, it was always second choice. So, in an excuse to find more ways to eat more things that taste like tacos, and to chip away at the egregious amount of dried beans and grains I realized I apparently hoard when taking these photos this month, this is my grain bowl take on the green rice you often see in Mexican cuisine, and a quick way to make plain red beans better. Together in a bowl, my hope is that it’s bright, colorful and spring-like enough that it follows my current cooking mantra, as suggested by Dinner: A Love Story: “Cook for the season you want, not the one you’re stuck with.” Guys, I think it’s working. You can go high or low, fast or slow, with these ingredients. I used hard white wheat berries, which take a full hour to cook, but have a tiny chewy bite that’s my current favorite, but you could use farro, freekeh, barley, quinoa, brown rice or another grain you like here, just adjust the cooking time and liquid amount to the package directions. I used red beans I’d soaked and cooked this weekend, but you could use canned as well, to save time. (Goya are my absolute favorite for reliably intact and un-mushy beans from a can.) Minus the sour cream or any added cheese, this dish is vegan as well as vegetarian. Finally, my grains aren’t terribly green because I’m distracted these days, but if you hold back some green puree until the end, it will brighten up the whole dish. 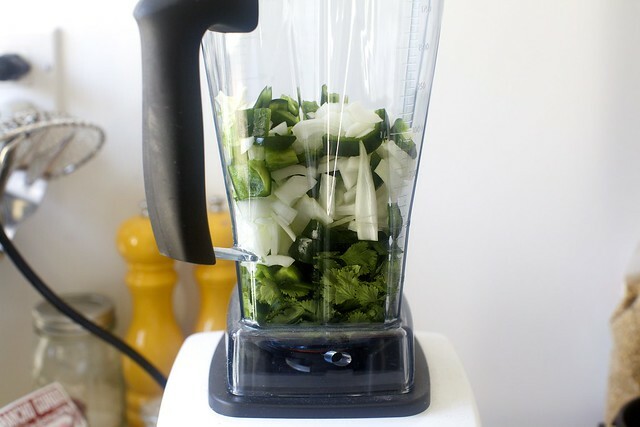 Make green grains: In a blender or food processor, combine poblanos, cilantro, onion and garlic with a splash of cooking broth or water and puree until smooth. 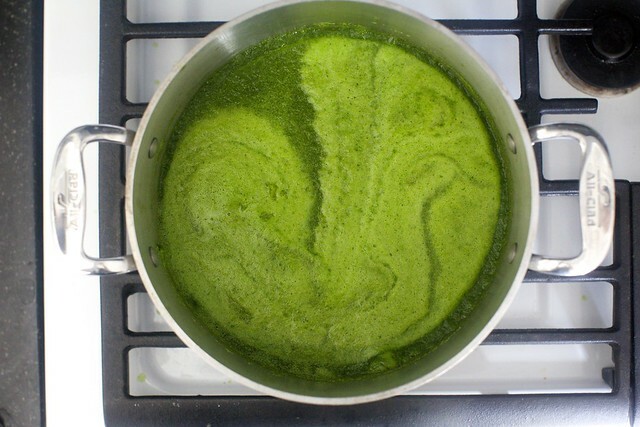 In a medium saucepan, combine wheat berries, remaining cooking water or broth, 3/4 of green puree and salt to taste over high heat and bring to a boil. Reduce to a very low simmer and cover, cooking for 1 hour, or until grains are chewy-tender. Add remaining green puree and cook for 5 minutes more. Meanwhile, make red beans: In a smaller saucepan, heat olive oil over medium. Add garlic and cook for 30 seconds, just until sizzling. Add chipotle, cumin, oregano and tomato paste and cook together for 1 minute. Add water or broth, beans and salt to taste and bring to a gentle simmer. Cook for 10 minutes on low. Assemble and eat: For each bowl, I like about 2/3 grains and 1/3 beans, but you can go half-half as well. Top with desired fixings, don’t hold back. (The sour cream was particularly awesome here, in our opinion, although decidedly un-vegan.) Repeat as needed. * Cilantro: If you’ve been following along for a while here (although I cannot imagine why my persnickety ingredient preferences would hold your attention), you might have heard me refer over the years to cilantro as “the devil’s herb” as I am one of the unfortunate ones for whom it tastes mostly like dirt. Yes, unfortunate, as it comes on or in almost every cuisine I adore. I don’t know what came over me this week, but I went to the store with a plan to replace the cilantro with parsley, as I often do, and bought the evil greens instead. And cooked with them. And ate them. Maybe it’s the blending with peppers, onions and broth that mellowed it. Maybe, for once, these food cravings could be for good, and not just butter. Either way: hooray! 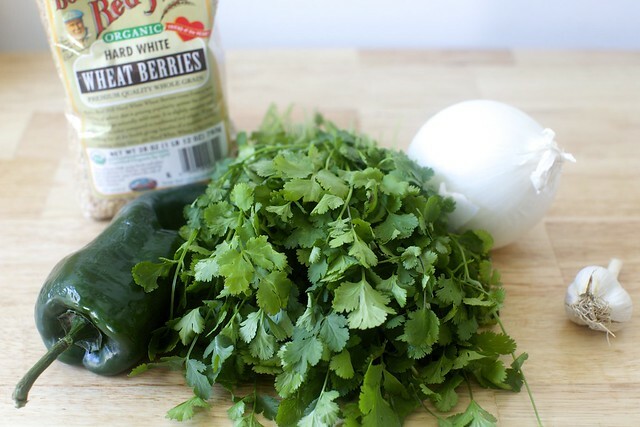 My comment was going to be on cilantro too – I have never heard of cooking cilantro that long! I imagine the taste of it would be cooked nearly clean away! Don’t most green herbs turn slightly bitter when cooked for so long? J.A. — We didn’t find it bitter, but if you’re nervous, you can tip more of it in at the end and less in the beginning. You’ll also have a stronger onion/garlic/pepper flavor. Yum! That is just what I need to eat. I happen to have some homemade black beans taking up some valuable freezer real estate, so I’ll be doctoring those up instead of red beans. All your fixings plus thinly sliced radishes and toasted pepitas and I’ll be heaven. Your next cilantro recipe should be cilantro pesto! My neighbor ABHORS cilantro, and she ate it without realizing what it was. I love this post! I’ve been making many of your recipes for at least a couple years. But this is more than a recipe, it’s a way of thinking! I overbought on red beans (thinking I would make red bean chili) and I have a bag of faro that I just haven’t used. I will making this meal today! Yay to cilantro! I can’t get enough of the stuff and am ecstatic to see a recipe here including it. This will make its way to my table soon enough. This looks divine!! So healthy and delicious, can’t wait to try this recipe! I was just going to comment on the fact that, at some point, I remember feeling great anti-cilantro affinity with you and I was about to implore you to tell me your secret! I would love to not hate this herb, since it’s everywhere and in (what seems like) every cuisine. But if pregnancy is the only way to flip that aversion then I guess I’m out of luck :). Congratulations to you! Ha! So, Eric is not a fan of cilantro… BUT I have gotten him to eat it when I finely chop it. He says he can deal with that… that the soapy flavor he normally gets from it isn’t as strong. Anyway, I might have to give this a try and serve it to him just to see if he goes for it. I was cilantro adverse until getting some very fresh from the Farmer’s Market in my quest to get past the aversion…as you said, it is included in lots of cuisine and I kept reading that if you try long enough. Anyway, that one fresh batch did it for me (wasn’t pregnant, but WAS in menopause ??? ) and now I love it. I am also a huge Rancho Gordo fan and have some of the Sangre de Toros in my pantry. Wheat berries I’m missing but I think I’ll give it a go with some brown rice. I ate cilantro with impunity before my first pregnancy. After pregnancy, I thought it tasted like soap. Cilantro is one crazy herb. oh man. i am a cilantro fan and a food-in-bowls fan. i haven’t ever made wheat berries but maybe i’ll try. i just never remember to soak my beans ahead of time. maybe if i put some in today it will force me to cook tomorrow! I hated cilantro for years. Thought it tasted like soap. Then one day it didn’t. btw, some fresh corn would be good in this. Or maybe grilled? Cilantro is a requirement when making a proper sofrito (which basically you did-peppers,onion,garlic,cilantro) it adds that earthiness that really can’t be duplicated with parsley. Sofrito makes a great base for soups and stews in latin cooking. I save the stems and roots too — I use it for thai style cooking, it adds a peppery-ness that leaves your taste buds wondering. My husband detests raw cilantro but doesnt mind if its been cooked down. I love cilantro, so i’ll take a few sprigs on top as well. I can’t wait to try this recipe. If I didn’t want to eat wheatberries, would you have any particular grain recommendations, or would you just say to pick my favorite and go with it? Thanks! I’m one of those who love cilantro and this is my kind of meal! I’m not overfond of wheatberries but I know this will work with other grains as well as a variety of beans. Thanks Deb for another great recipe! My Israeli mother-in-law makes a green rice dish with big bunches of cilantro, we add tofu and make it a one dish meal. Sounds incredible!! Does this work well to double or triple? Will it reheat well you think? My wife just made the declaration that we cannot eat at Chipotle every. single. night. anymore. So yes, any opportunity to make a little more Mexican-ish food at home is a good idea! Beans and greens, sounds good to me. Nutritious and filling for this hungry man. Plus, yes, they make Spanx for men, but no, my wife is dead set against it and says I’m not even allowed to look! Ina garden hates cilantro too. She doesn’t include it in any of her recipes. You are a genious. I’m making this recipe this weekend. 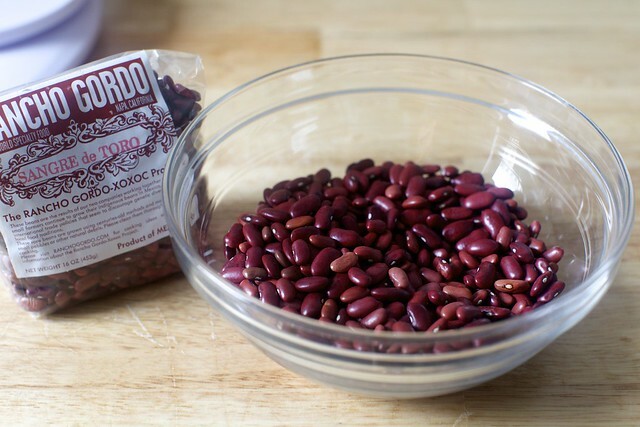 Oh man, I usually call small red beans “kidney,” but I see that Rancho Gordo calls them “bull’s blood”! Love it. What a wonderful take on a burrito bowl. I love cilantro however I have found that the particularly muddy ones to me taste like soap. And I agree that pregnancy changes taste buds- For the duration of the pregnancy I hated chocolate and I used to eat a bar a day! Regarding cooking for a while- cilantro loses it punch but mellows into something beautiful(I do this for Indian dals). I would second Deb’s recommendation on adding a little at the end too! Cilantro is so good for you! I love how much you used! I am so glad you don’t use chicken stock! It is so over-used in beans and soups! I am not a fan of anything flavored with chicken so I use water and lots of onions and herbs for flavoring beans. I love cilantro and lime~great combo. Making a list now to get all the ingredients to try this dish. Thanks!! Went I visited my grandmother in Iran, she would start many recipes by washing and picking through a HUGE bushel of cilantro, which would then be stewed with meats, legumes, etc. Cilantro isn’t just great for a burst of raw freshness; it’s also delicious when stewed slow in large quantities like this. Takes on a totally different flavor. Laura — Pick your favorite. I know the TJ’s 5-Minute Grains have been very popular here (at least in the comments) so that might be good in a pinch, I think they have farro. Quinoa might work too, just a little less hearty (to me, at least). Or brown rice. I have a deep affection for short-grain brown rice, if you can find Japanese stuff, even better. Cilantro — My MIL minces cilantro with (I think) parsley, garlic, olive oil and keeps it in the fridge to use with various dishes and it doesn’t bother me at all! I think it might be about not eating it solo for me. I’m also (shh) kind of weird about ginger. I love it in Indian dishes, Thai, Japanese, everything… but with other ingredients, like garlic, soy, etc. Solo, shudder. Maybe that’s the gateway — mixing it with other stuff. That said, I don’t know if this is weird or not, but it really bothers me that there are foods I don’t like. So, I’m always trying to find ways to get over them, sometimes more successfully than others. I am totally going to add a tomatillo to the grain! Deb, that is not just you! Last week I tried mussels again- when I realized I did not hate them I was so ecstatic about it! I ordered a multi-pack of grains and legumes from “Palouse Brand”. We had such a craving for hummus, it just had to be. So 3 packs of wheat berries. I was going to grind them to put in bread, but saw this recipe and put the berries on to cook this morning. Since I had made beans last night, it was as good a match as made by a professional Sadchan. Burp! It was yummy. Served with some quesadillas. This is reminiscent of many a good Cookie and Kate recipe! PS, if you need inspiration for your taco-related dinners, she has a ton of ideas. Quesadillas. Burrito Bowls. Tacos. So. much. good. stuff. It’s not weird at all to be bothered there are things you don’t like. I’m constantly annoyed by the fact that I don’t like bananas. They’re portable, and potassium laden and nope. I think they taste horrible. I try them a few times a year (at different levels of ripeness) to make sure I still don’t like them because I WANT TO LIKE THEM! Hahaha, as a long time reader the first thing I thought was, “oh, there’s a big bunch of clilantro, wait, Deb hates the stuff.” As a cilantro lover, one who always has a bunch in the fridge cause you know you’re gonna need some… I hope you can continue to enjoy it. I recently ordered some frekkeh and haven’t been motivated to try it since I’m not familiar with it. This is a great way to jump in, I think. I love me a quinoa bowl, and love faro ( I make that one-pot recipe with the tomatoes of yours regularly) so I’m excited to try this. I love recipes like this that aren’t static, and can be tweaked to accommodate tastes and what is in the fridge. I’m also gonna give a shout out to Rancho Gordo, I have ordered their beans for years and they never disappoint. I’m curious what your onion pickling technique is. I need more pickled onions in my life. Maybe you will try beets again? Please? Thanks for another flavorful non-meat entrée to add to the repertoire! Yum, yum! I’m going to suggest that for people who can taste the wonderful brightness and pure green flavor of cilantro, this would probably be better if you did not cook the cilantro with the grains but just added it in after. I made it today with quinoa(so only 15 mins) and definitely think the cooking kind of muddied the lovely cilantro flavor. That’s probably why it didn’t taste as bad as usual for you. But for cilantro loving people we would never want to boil down and subdue that beautiful flavor! Love the night-time family photo! This looks so delicious, and I can’t wait to try this recipe out. It’s cold and snowy here so this will be a yummy treat for dinner. I have been obsessed with mexican foods lately but we don’t have a huge variety of mexican ingredients in our local supermarket (salsa, flour tortillas and corn chips) This is a great idea to change it up a bit. I can’t wait to try it! Thanks for the recipe :) I’m excited!! You just simplified a dish I LOVE – but never have had the guts to make from scratch. Thanks!! It looks like I have found myself a new favorite!! -and topped with tons of cilantro!! YUMMM!! There are a couple of posts about cilantro. The genetic testing service 23andme recently announced their discovery that liking cilantro or not has genetic markers… You either are wired to like it, or to hate it. I thought it was fascinating that something as abstract as a flavor preference could be genetically hard wired. So, all of you, who like me, struggle with cilantro… rejoice! It’s not your fault, and you can legitimately blame your parents. Liking or not liking foods is pretty fascinating. I like to eat almost everything…the only trouble I have is with some seafood, especially raw. Can not do that. But I generally love fish. Then there are sardines. I could not eat them as a child, then one day my husband cooked some large variety, I was starving and thought they were wonderful. Yay, I thought, now I can eat sardines. Later, he cooked them again, different variety in tomato sauce and I could not even gag them down. sigh. Can’t do spicy either, so I have to be very wary in restaurants where, for some reason everything is spicy these days. Happy to make the red bean and green grain taco bowl and spice it as I please! Thanks! Is it weird that I’m kind of disappointed that you eat cilantro now? I can no longer say, “But Deb hates it too!”. Yes, we’re on a first name basis in this house. Also, love the Jersey cutting board! And this recipe looks great (minus the cilantro, duh). I usually hate cilantro, but have discovered recently that cooking it makes it FAR less objectionable. I don’t typically care for anything “taco” that doesn’t involve a corn tortilla in some form, but this looks pretty fantastic. Have you heard that children tend to prefer the foods the mother ate while pregnant with them? So, basically, this baby is going to be one heck of a taco fiend. Which is the best kind of fiend there is, in my book. Carole — Whoops, meant to link to it. I use the recipe in this post. Make extra; they keep well so long as they’re submerged. Ariel — Don’t worry, I’m still not ordering a salad with cilantro leaves in it! I just think up against a lot of garlic, onion and other flavors, it’s not so… loud. It must be the month for stuff-in-bowls. Last week, it was yu-choi, red pepper, onions n garlic tossed with udon noodles in a miso dressing (as versus peanut dressing) and quick-pickled cabbage for crunch. This week it’s barley base (wheat berries, rice, freekeh), chick peas sauteed with garlic, onion and tomato, topped with lettuce, artichoke hearts, olives and goat cheese in lemon vinagrette. Its a bit eclectic, still needs a bit of work. I’m wanting to help melt the (now ugly) snow. Ugh. My Rancho Gordo collection is ridiculous! I’m really going to try to incorporate them into weekly meals. I love the beans, they just seem to pile up so quickly. I love that your pregnancy cravings are the same as my everyday ones. This has been recipe heaven for me!! Keep them coming! I love the new night stands, BTW. OMG. Also, I just read your upstairs neighbor comment. I seriously wonder what the hell mine are doing. How can they be that loud? It sounds like they are turning over blocks of concrete and running laps. Grrrrrrr!!! Amazing and yummy thank you. Just wanted to say that I love your fabulous site, and that I recently spent a month and a half going through your archive bookmarking what I would make. I would also like to say thank you to you for inspiring me to take up food blogging again. Looking forward to the next book. These look delicious! Love the idea of lentils in a taco/mexican bowl – what a great idea to sneak those into this dish. They make a healthy addition. Can’t wait to try it! Just weighing in as a cilantro lover! My kids eat it raw on everything! Weird, right? Off topic sort of – I want to try rancho Gordon ( we eat supermarket dry black, red or Lima). Overwhelmed by site. What do readers suggest we start with? Thanks. I have never been familiar enough with grains but I think its a nice ingredient to change taste. I used to despise cilantro. I thought it tasted like soap. Then I married a CA man and moved west. You can’t avoid the devil’s weed if you live in CA. I think what got under my skin were the ungodly good fresh fajitas and I think you nailed the peppers/onions combination connection. eventually I have become a fanatical cilantro person. I find I must have it fresh chopped on all things. It adds …….something delectable and incredibly nibbly good. Super good on the green slurry… I WANT. …I WANT! I LOVE cilantro fresh, but am very skeptical of it cooked. Loved this, however. Next, will try your version! This sounds so fantastic. I am READY for lighter foods, like now. This looks fantastic. I will definitely make this this weekend for friends. I have just moved over to a plant-based diet, and this looks deliciously perfect. Thank you!!! I also absolutely HATE coriander / cilantro. With my Indian ancestry, this is pretty much the biggest sin! I used to hate cilantro as well, and the turning point for me came about 6 years ago when I made samosas and felt inclined to put cilantro in them. I don’t know why that changed everything, but it did, and now I LOVE cilantro. Made this last night; wheatberries exact to the recipe, but used dried chipotle powder and canned pink Goya beans. The bean flavor was actually great, while the wheatberries took much longer than the recipe indicates for me — after 90 minutes, they were chewy-tender, but the pot was still liquidy. The final result was a hit — we topped with red peppers, avocados, parsley and pickled red onions, I think next time I’ll definitely use sour cream. Thanks! I’ve seen lots of comments about cilantro here (I’m a hater), but I don’t think I’ve seen anyone ask if flat leaf parsley can be substituted? Everything else about this looks great! WOW. This – yes. This is what I need today. Than kyou! Anna — Yes, you could use flat-leaf parsley. Bryan — Curious what brand you used. I agree that they can take forever — this screams out for a pressure cooker adaptation, something I’m overdue for, or at least rice-cooker, so you can be totally hands off — but for me, there was little change in their texture after 60 minutes. Glad you liked the beans. Looks delicious! When I was in the worst of my morning sickness with no 2, one of the few things I could eat was your Huevos Rancheros. So thank you! I probably would have like this too. This sounds great, so colorful and fresh-looking – I agree just what we need (along with the sun that is finally out and little bit of warmth here at least) to get in a more spring mood. I’ve made some similarly flavored rice recently and it was great so can imagine this will be tasty. are red beans distinct from kidney beans at all? ps– psyched about lack of current cilantro aversion! i fully understand your frustration with disliking some foods. i do not like raw bell peppers, and yet, i keep trying them in hopes they won’t be so awful. I live in White Plains, just outside NYC, and can NOT for the life of me find poblano peppers! I’d check a Mexican/central American grocery store but the area is so whitewashed. You’re within a thirty mile radius of me, and while the metro north isn’t the best way to go get groceries, where are you purchasing these fresh, lovely poblanos?? And ultimately, can I sub in another pepper? So, am I dropping the whole poblano in the blender? Seeded? No stems? I’m a little afraid. . . I also LOVE cumin and have learned its versatility (and ubiquity!) through many of your recipes. “Cumin has also literally been popular since the dawn of written history.” from The Salt blog on NPR today. Cumin is the only word in the English language that traces directly back to Sumerian! Try culantro some time. It’s a flat leaf with a bit of a milder taste than cilantro. I need to bring a vegetarian dish to a St. Joseph’s day altar lunch, and since this is meatless AND also red, white, and green (the colors of the day!) I think this will work perfectly. Katie — Nope, that should have said cored and chopped. Now fixed. Kelly — Given, I live below 14th Street in Manhattan and have a lot of stores at my disposal, but I can find them at a lot of stores, fairly reliably — Whole Foods, no-name grocery stores and these (rather withered specimen) were from Westside Market, a local chain that’s like a cross between a large bodega and a full-fledged grocery store. But! I’m not trying to rub it in. How about a jalapeno? Maybe just use one to start. Poblanos are pretty mild, but large. sfb — Kidney beans are a kind of red bean, and would work here. If you have a chance to find something smaller, I prefer a smaller red bean here. I love how cilantro works in this dish, I’ve used it in mild green curries before and its intense flavour is quite a kicker. This taco bowl looks just as intense and a healthy concoction at the same time. Making this right now! I’m using farro, because it’s what I had on hand. And instead of the beans, I’m simmering some smoked pork I need to use in the same sauce. One last small tweak: Because I had a can of tomato sauce open already in the fridge, I used that instead of the tomato paste + water. Everything smells absolutely amazing!! We are definitely going to try it with sour cream. Ok, this was BOMB. Thank you! Kelly! Hope you get this. I actually am visiting your area right now and found just today, a great treasure of a food source! HMart on Central Ave.
It’s phenomenal and surely to have poblano peppers. Also right there in the same strip mall is a “Mrs Greens”, for which i have had variable luck finding poblanos. Also, doesn’t Whole Foods in White Plains usually have? Good luck and check out HMart- just for the sheer fun of it. You are so lucky to have that store nearby. Also Deb… SO lovely to hear that you actively try to like the foods you hate. I want to hear updates on the cilantro inclusion, if they happen. Looks delicious, just like something you’d find in the Kauai restaurant chain in South Africa. I feel the same way – about feeling bad that I don’t like certain foods, and trying ever more recipes involving that food, trying to rectify the situation. I think roasting was my answer to the cauliflower dread, but I still haven’t found a way to like cooked oatmeal. Mexican-y style beans and greens like this recipe, on the other hand, require no such work – yum! Oh my goodness, I made the beans and farro ahead of time today to have for lunch tomorrow, and I don’t think I’ll be able to sleep tonight for fantasizing about it! I added the last half of the cilantro mixture to the farro after it had cooled and that gave it a lovely color. The only thing I will do different next time is to use only about a tsp of chipotle in the beans. I used a whole one in adobo sauce and it was a little too hot for me…but for those of you who love your lips to burn, it would be fine. I cooked my own red beans, but given all the flavors you add to them at the end, I think next time I will enjoy the convenience of canned ones. This is just a wonderful recipe. mmmmmmm, made a variation of this with parsley and black beans in a burrito. so goodness. thanks for the inspiration! Just made this with brown rice, and currently enjoying so very thoroughly. You never disappoint, Deb! What wonderful news to read that you are pregnant…my first was quiet too and my second very active…both are girls..
My second baby has a sweet temperament,the one that always said the most profound things,sang,hummed,whistled happily all the time and loved movement right from the start.i used to call her monkey,my just turned 20 year old is studying to become a nurse.. 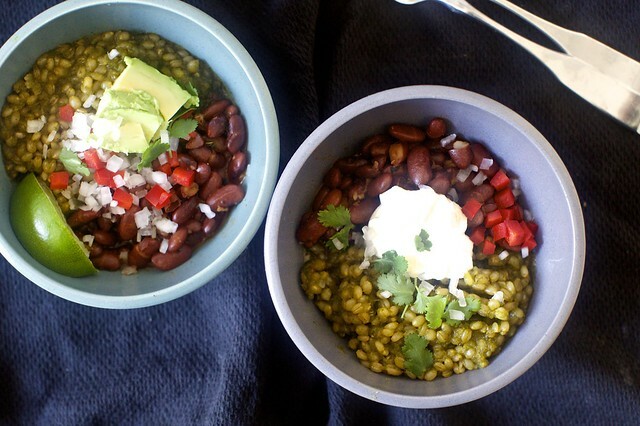 This looks like a great alternative when I’m bored with chili :) LOVE a grain bowl! really simple. really delish. i ended up with a lot of leftover green sauce, but i imagine worse alternate realities, so. Re: cooking time on wheat berries – mine (Shiloh farms) also took forever to soften up. The bag said simmer 2-5 hours !! I cooked for about 90 min, then took them off direct heat and let them steam for another 30 min. Finally al dente. I may try pre cooked next time — in frozen food section @ whole foods. This was so delicious! We made it with brown rice and 1 full pound of dried red beans. The leftovers will make for easy lunches throughout the week. I am also not usually a fan of cilantro, but it was great here! Thanks Deb! Made this last night for dinner and it was great. I used Pearl Barley instead, and it took about 40 minutes to cook. I’m looking forward to left overs for lunch today. oooh I know what’s for dinner on Friday! meatless for Lent is tough when your DH doesn’t like seafood. As I served this to my husband with both(!) my 5 and 7-year-old already raving about it, I let him know that I hoped he liked it because it is all we are having from here on out. This is THE addition to my week-night repertoire I’ve been waiting for. It is easy, satisfying and likely versatile. Next time I’ll double it. I had “Jovial” brand organic wheat berries which I’m happy to say had a shorter cooking time: about 35 minutes; and I used probably 1 1/3+ cup berries with three cups liquid. Also, canned pintos were of course just fine, though I’ll look for small red beans because I trust you, Deb, and will follow you anywhere. Thank you. I was all set to make this with wheat berries last night, then dinner got a later than expected start, so I switched to red quinoa. Rave reviews here! My only suggestion would be to cut down on the cooking liquid for quinoa – I made a double batch, and used 4 cups of broth to 2 cups of quinoa. I think cutting back to 3 – 3 1/2 cups of broth would have been just right. Still delicious, and worth the extra few minutes cooking time. Thank you for another winner! Absolutely delicious! This will go into heavy rotation here. It’s interesting that pressure cooking came up (in Deb’s comment 76), because I just made this and used my electric pressure cooker! I used it two ways – one to just pre-cook the beans, that went fine, and I finished them on the stovetop as the wheat berries cooked and they tasted nice (wow, chipotle is hot – I used a whole one). But the wheat berries came out a little strange, and I’m not sure if it’s something else I did or the pressure cooker or both. 1. Used frozen cilantro (what else am I gonna use it for?). 2. My green paste was pretty liquidy because I was using the vitamix and didn’t bother pre-chopping, so it needed about 8oz liquid. 3. Included all the green paste in the cooking liquid, and didn’t add much salt. 4. Pressure cooked the wheat berries. My Instant Pot said to use 3:1 ratio, and the recipe says to use a regular amount of cooking liquid minus the previously added water, so I counted the cup I had already put in, and added two more cups. Put that all in and ran it through at high pressure for 30 min, then did the quick release. The result was very watery, basically like wheat berry in weird green soup – not a green grain at all. And it didn’t taste that awesome. The wheat berries were still super firm too. I tried one small bowl, and then I left it a couple hours on keep-warm. After that the berries got softer and it was a little less liquidy, but still very wet. I think clearly I put too much water in, but I also wonder if the frozen cilantro was a mistake, or I didn’t put enough salt, or the pressure cooking did something strange to the flavor especially of the cilantro. I’m going to check it again tomorrow and see if adding a little salt helps. Made this for dinner tonight with brown rice and it was a hit all around (five out of five of us), which is an extremely rare occurrence. Thanks for another great recipe! My 6 year old helped me prep dinner and saw all the ingredients that went into the rice (things she’d normally never eat). She also usually tells me that although she loves black beans, she really doesn’t like any other kind (which is ridiculous, of course). Still, she called this dish delicious and declared that “I *must* make this again.” We loved it! Also, I made this with brown rice, in the rice cooker. It took about 50% longer than usual in the rice cooker, so plan ahead if you’re going to try it, but it still turned out great! Deb, do you drain the beans once they are finished coking? Made this tonight….absolutely delicious! Great flavors! Hi Deb! Been fiending to make this since you posted! Just wondering if this works well as a do-ahead, or is better eaten right away? Wasn’t sure if it might dry out, etc. Thanks! Renee — I wouldn’t mix the bowl the day before but the separate elements (grains, beans) should reheat well. Grains have a tendency to dry a little; reheating them with a little extra water can help. Danielle — No, I do not. Or, I at least use some of the sauce in the bean pot to dress the bowl. I loved it! The family did not, even the other adult. :( Too healthy-looking, I guess. You started by quoting Sandra Boynton, right? I’ve already read Opposites multiple times today. Thanks for this delicious recipe (and all the others)! Made this with curly parsley instead of cilantro (wife can’t stand it) and farro instead of wheat berries. Served it with some fried smashed plantains and quick-pickled jalapeño and red onion. Wow. I wasn’t sure if the grains would come out right but they were perfect. I did need to drain them a little before serving though. The farro cooks a lot quicker than wheat berries and its what I happened to have on hand. I will be making this again. Keep up the good work Deb! Fantastic recipe! Nice base to which you are free to play with as noted in the intro. I used a can of kidney beans I had on hand and a faster cooking wheat berry grain in my version (cooked in 15 min). Absolutely LOVED it. Made a little plate of toppings- including pico de gallo, pickled jalapeno, sour cream, and extra onions and cilantro. Lastly, I served it with taco shells- to be made into a taco if desired or to be crunched up on top of bowl. Fun, delicious, and healthy. It’s going into my permanent file of favorite recipes. I haven’t tried it cold, but bet it would be good cold as well– thinking of it as a good lunch recipe to take with me to work. I teach and will be going back to work soon– need things that don’t need to be heated. This might need to be in my lunch rotation as well! :) Thanks for another winning recipe Deb! I tried this recipe using dried red kidney beans and I just couldn’t get them tender, they were incredibly crunchy. I had slightly better success with the wheatberries, but just barely. I’m using a gas stove and followed the instructions closely. How could this have gone awry? This recipe looks great and I love your blog, so I’d love tips on how to get the beans to be tender and chewy! Yozhik — Might the beans have been older or stale? They can take longer if so, but should ultimately always get soft. The beans were fresh, I bought them the same day. They just refused to soften. Would soaking them overnight have helped? Delish! Made this last night, loved it so much I made it again tonight!!! I topped with fresh tomatoes, diced onions, lime juice, avocado and sour cream! I’m planning to make this tomorrow and I’m wondering if you drain the liquid from the beans (I’ll be using canned). I usually keep the liquid when cooking black beans, but I don’t cook with red beans often. 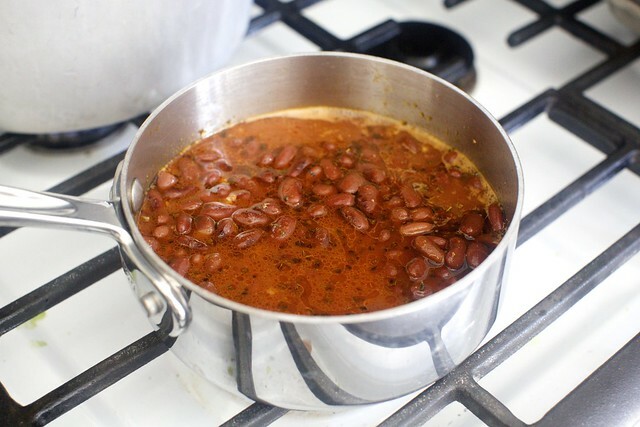 Nicole — I always keep bean cooking liquid; it adds great flavor to dishes. I always drain canned because it has thickeners, it’s kind of slimy. I love this recipe. I’ve made it twice now and every time I stray from the instructions on accident (like when I thought you said 1/2 or 1 CAN of chipotle instead of 1/2 or 1 chipotle – singular) and it always comes out delicious anyway (abet perhaps a tad too spicy… my fault, not yours). I just wanted to tell you this. I just got back from Italy and it’s the perfect recipe to eat at lunch this week while trying work the carbs out of my system. Keep up the good work! Just had this for dinner (and leftovers for lunch), and it was incredible! We made it vegan, and didn’t miss a thing. Brown rice and kidney beans, toppings were pickled onions and jalapenos (two bowls, one for each, half vinegar, half water, with a pinch of sugar and salt, let sit overnight) and cilantro and lime. This recipe looks fantastic. Would be great if it came in a printable format. This dish has become our Tuesday night go to dish. My 7 and 9 year old girls demand it! I do brown rice instead of wheat berries, and add about a half a bunch of whatever greens we have on hand to the blender mix. We’ve also used beans other than red if that’s what we have on hand. t’s quick and satisfying. Thanks! This was really good! Our toddler even asked for seconds! The only problem I had is that when I doubled the recipe, 6 c of water was way too much? I feel like I must have made a mistake. Anyway, draining the wheatberries and then adding in the remaining poblano, cilantro mix easily remedied the problem. Fab way to make rice!! I was so full off a little bit of this meal. I will always blend cilantro to cook rice from now on when I have it! Just made this using brown rice, and mixture of red kidney beans and black beans (both canned). Also used cilantro / coriander in beans instead of oregano (bc I hate it! Heh), and had to use different chile peppers in the rice as couldn’t find anywhere in Melbourne with poblanos! But so easy, healthy and totally delish… thankyou once again Deb for another easy but interesting mid week dinner!! Hi! I made this using brown rice. I really wanted to use quinoa but my boyfriend is so weary of those “types” of grains. I used 3/4 of the green sauce plus a cup and a half of vegetable stock to cook the rice. I cannot quite remember but I am pretty sure I ended up with like 24 oz of green sauce after blending it all up. After about 40 minutes the rice was tender but still had a bite to it and I did not find that I needed, or could, add the remaining green sauce. I was afraid it would make it too soupy as it was already pretty luscious! I used one can of a black bean, kidney bean, and pinto bean medley + one can of white beans. No tomato paste so I used a table spoon of the adobo sauce. SO GOOD. SO SO SO GOOD. Just ate the two together with some raw white onion, cilantro, lime, sour cream and tortilla chips. Seriously so delicious and great for leftovers. Pretty budget friendly as well :) Thank you Deb!! !